The Post office connected Naperville’s settlers to the wider world. The postal system was the primary means of circulating news and information in the United States in the nineteenth century. Letters and newspapers from back east sent through the U.S. mail kept Napervillians informed about everything from family gossip to business dealings to national and world events. This modest wood-framed building was the family home and store of carpenter and merchant Alexander H. Howard, one of Naperville’s early postmasters. 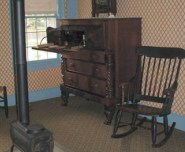 It also served early settlers as both the town’s post office and a stop on the stagecoach route that ran through DuPage County. Stagecoaches carried passengers and the mail long distances by horse-drawn carriages. When a stagecoach arrived, settlers would gather by the post office, hoping to receive a letter or to hear a neighbor read aloud from a newspaper just delivered from the East Coast. The post office was a general meeting place for friends and fellow citizens to exchange news and gossip. 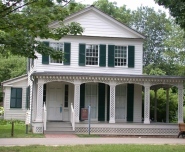 Alexander Hamilton Howard built this house in 1833 in the Greek Revival architectural style. The building’s name comes from the groves of native paw paw fruit trees that thrived in northern Illinois in the nineteenth century. 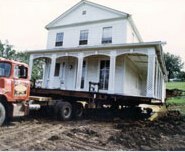 The house was moved to Naper Settlement from Webster Street and Jefferson Avenue in 1977.